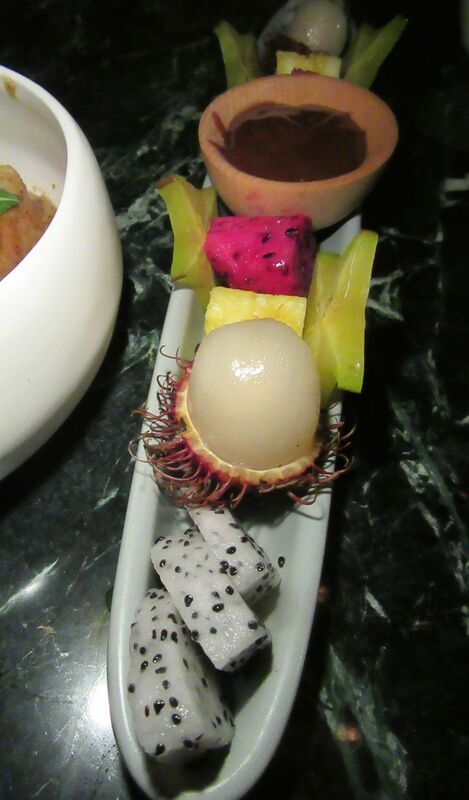 Familiar and exotic fruit line up in this long narrow platter at Wayan. 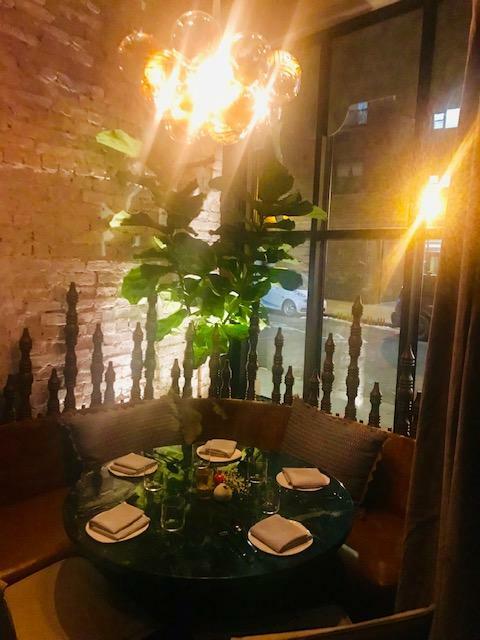 Tropical greens and carved wooden poles surround the booth in the window. It’s a long trip from the Upper West Side through Soho to Mott Street. Traffic on Spring creeps. But finally we are there. 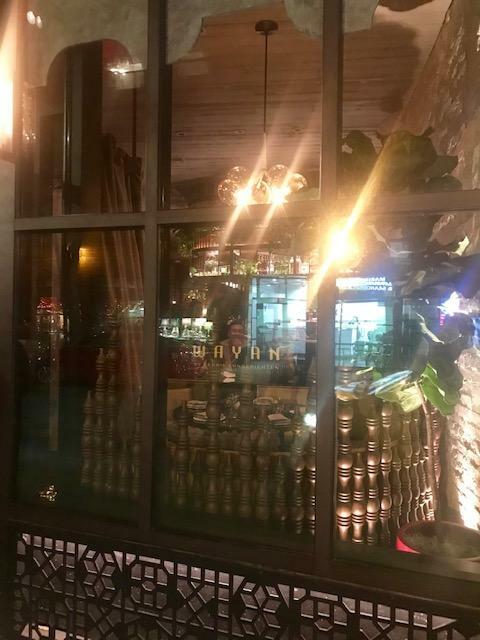 No way to miss the Rockwell Group’s tropical reveries -- the oxidized copper glazing, the batik screens, the amber glow, the Indonesian wood service door. 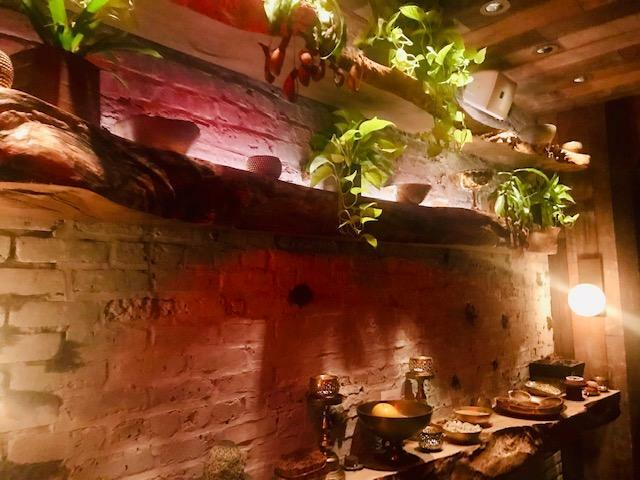 The room is long and narrow with a bar and then an eating counter half way. Our booth presses against the kitchen below these Indonesian dancers carved in wood. 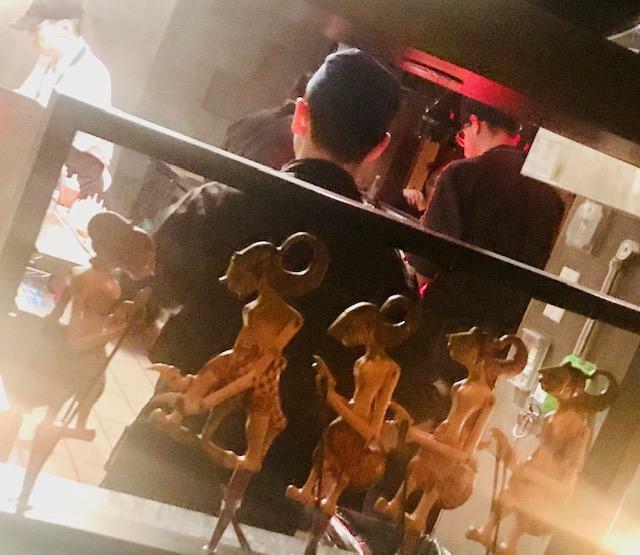 We troop past the open kitchen and the display of dishes, settling into a banquette up against the kitchen under carvings of Balinese dancers. 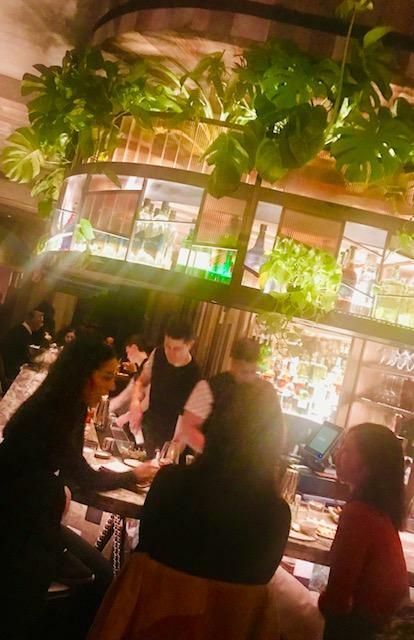 It seems most efficient to just let Ryan order the entire menu, doubling up on the tamarind-glazed pork ribs and the peekytoe crab cake with cucumber acar and sweet chili sauce. A chunk, a lump, a spoonful, or a rib for each of our seven. 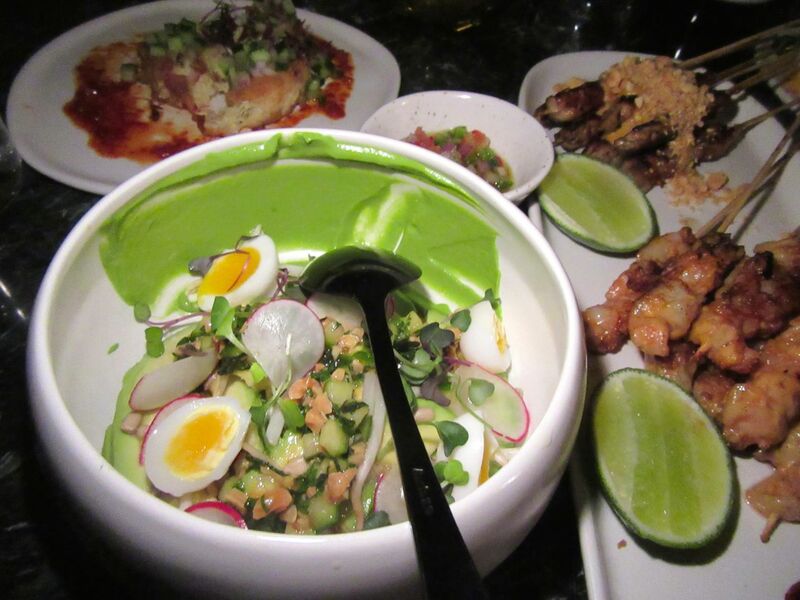 We let Ryan order for the seven of us and divide whatever comes, like this avocado gado gado with quail eggs. 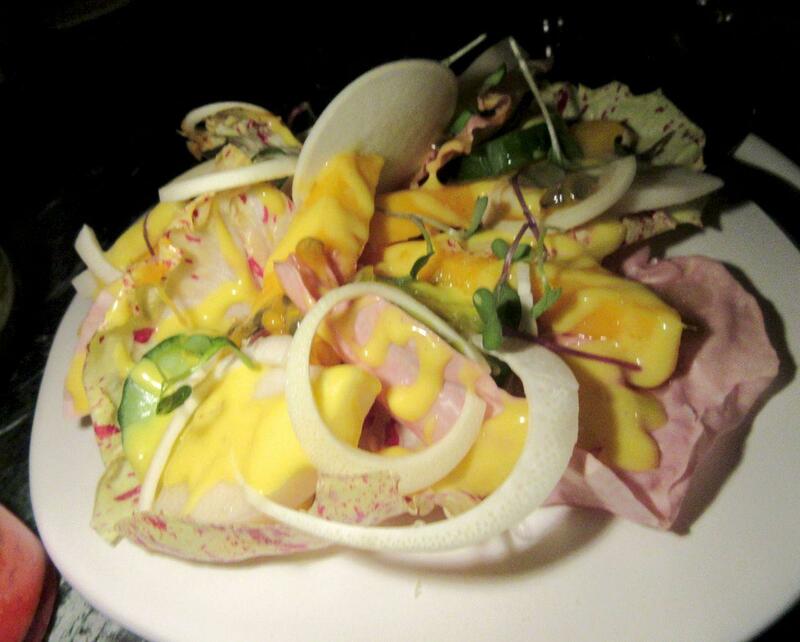 Kitchen runners deliver hearts of palm with mango and passion fruit for us to share. I sip my Greater Galanga Sour as runners from the kitchen rush us hearts of palm with mango and passion fruit, and clams with coconut and kaffir plus various sauces and condiments. There are elongated spring rolls too hot to bite, a collection of satays on skewers, and avocado gado gado with quail eggs and peanut relish. Everywhere, the tingle of lemongrass, ginger, coconut, and kaffir surprises. This is the table, all set for service, just inside the window, overlooking Spring Street. Photo by Dana Stoddard. There’s a shelf with dishes and platters on display as you pass by the kitchen. Photo by Dana Stoddard. 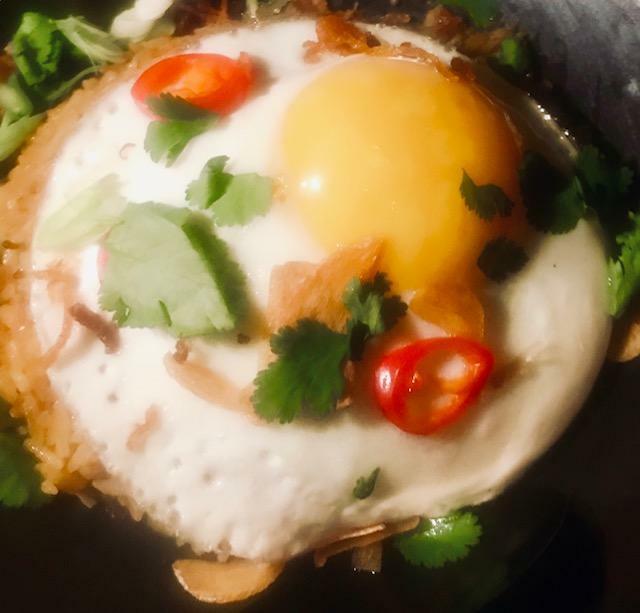 It’s Cédric’s first New York solo after he and Ochi opened two restaurants -- Le Burger and Vong Kitchen -- in Jakarta last year. He also remains the executive chef at Jean-Georges’ Perry Street in Richard Meier’s white modernist tower off the West Side Highway. 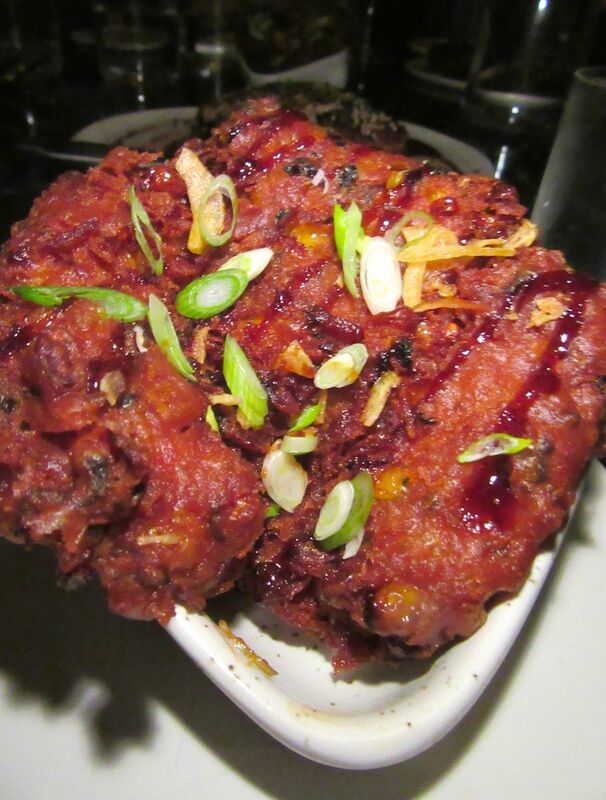 The corn cake could become addictive, too. 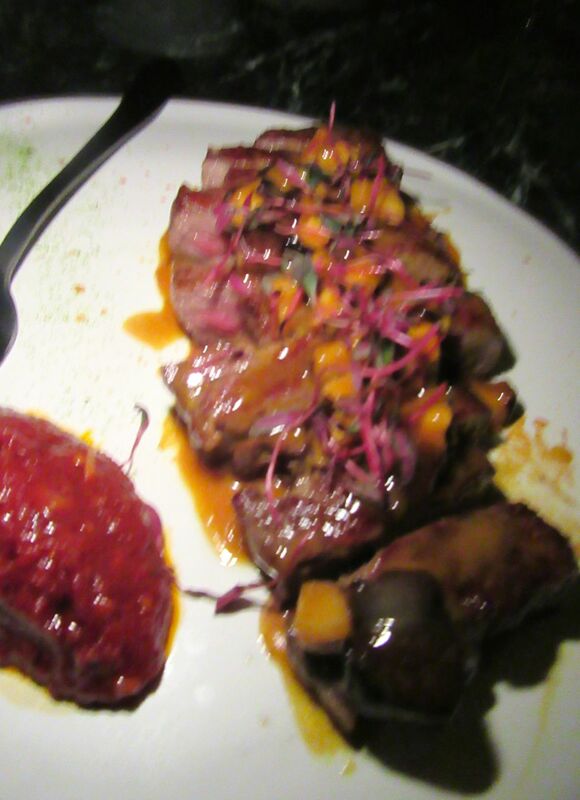 The strip loin is marinated and sauced with a complex collection of spices and herbs. At Wayan, Vongerichten uses French technique to play with dishes he and Ochi fell for in their travel to Bali and Komodo Island. It’s less about rigid authenticity and more about what New Yorkers will like. I don’t mind that at all. The wagyu strip loin is sauced with a spicy blend that might include turmeric, coriander, black pepper, galangal, ginger, chili pepper, garlic fennel, lemongrass, cinnamon, and caraway ground into a paste and cooked with coconut milk. Nasi goring means fried rice. Indonesians toss it with meats, vegetables and spices with sweetened soy sauce. 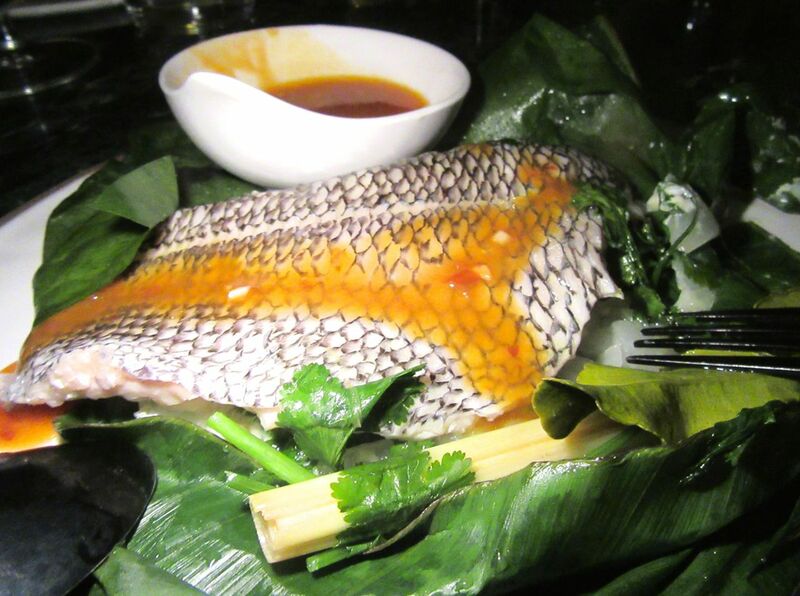 Steamed black sea bass is served with pea shoots and sauced with a tingling chili-calamansi vinaigrette. We pass bowls to the right. Pass platters to the left. “Do you have this yet? 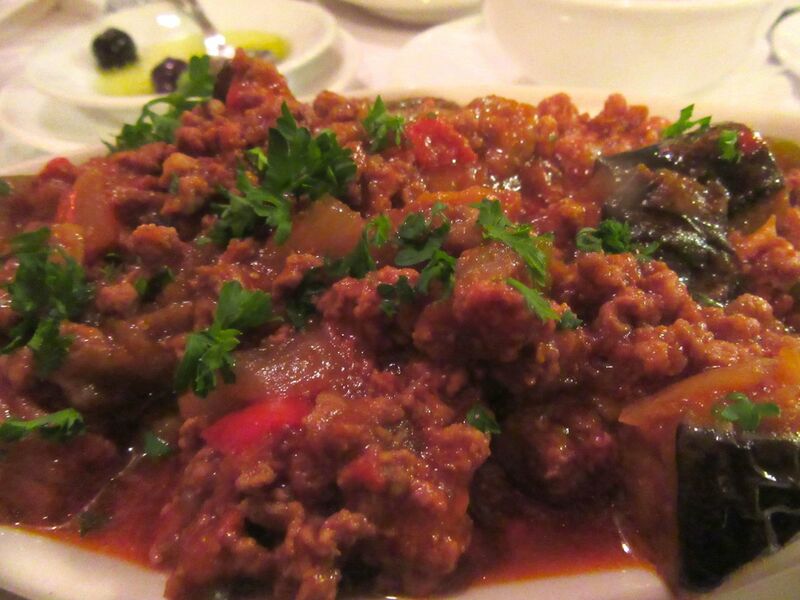 Clams, with coconut and kaffir?” “How many people have taken their share of the eggplant? Who’s still waiting for nasi goreng?” I didn’t experience this much demand for action in six hours at my computer today. But Ryan who spends the day dealing with foreign currency is determined that we won’t miss anything. Are we happy? Are we missing anything? Do we need forks or serving spoons? The server checks in. 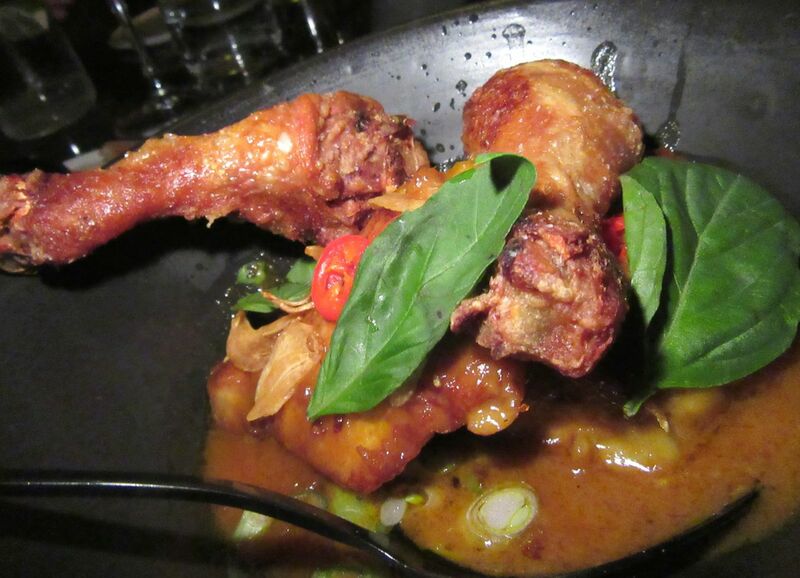 I take a chunk of dark meat from the plate of yellow chicken with lemongrass coconut. The silent servers arrange and rearrange the table, snatching away the ravaged platters so that whatever comes next will fit. Occasionally, the graceful Ochi comes by and smiles benign approval. Some of the spicing has been gentled for cautious eaters. The Rockwell Group design – rustic teak paneling, vintage lamps, nighttime shadows – transports us. It’s a charming blend of Walt Disney with authentic tour package. 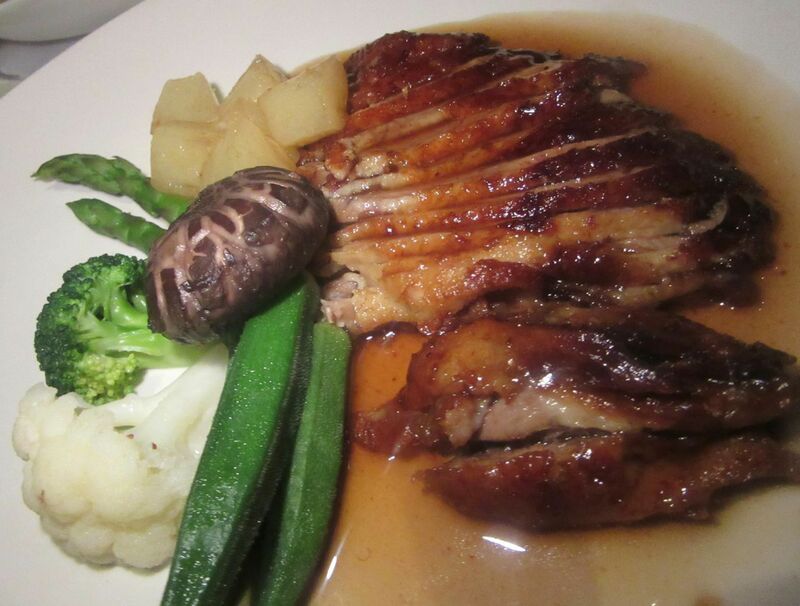 Syrupy kekap manis, sweet soy sauce, is the indispensible condiment in Indonesia. 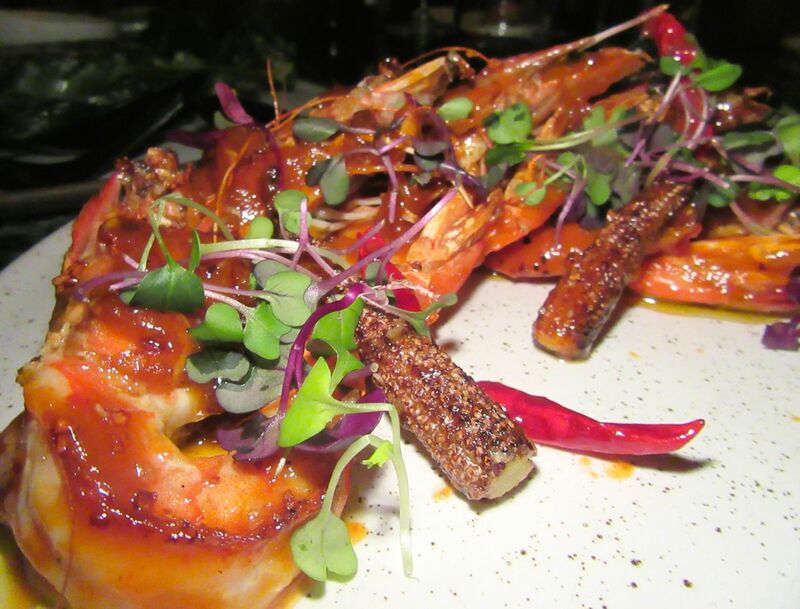 Large whole shrimp are sautéed with feisty sambal oelek and pickled red chili peppers in vinegar. 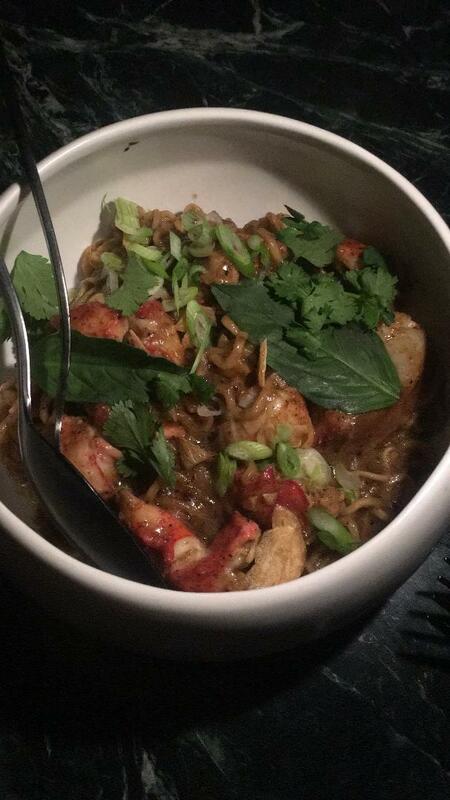 We ask the kitchen to slow down the delivery of large plates like lobster noodle with kecap manis, Indonesia’s syrupy soy sauce that tastes like molasses, and Thai basil. 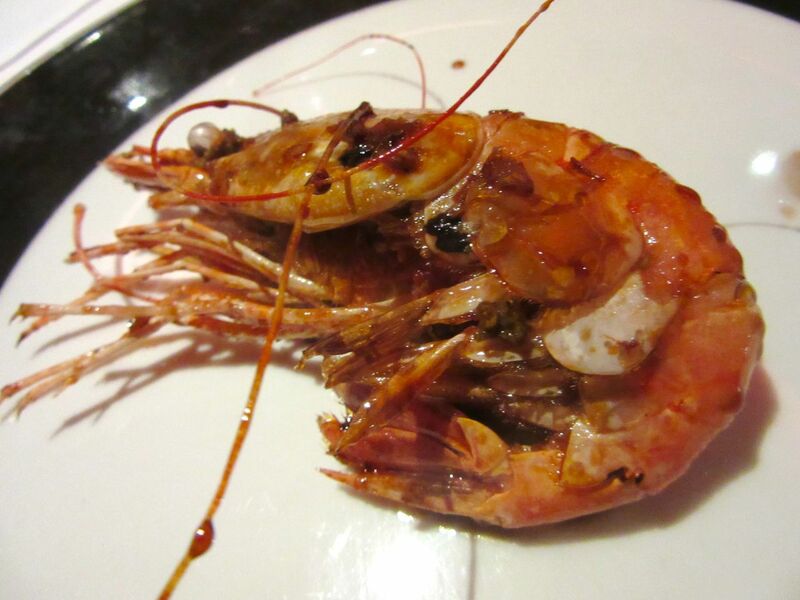 The shrimp, sautéed with feisty sambal oelek and pickled red chili peppers in vinegar, are so large and we’ve eaten so much, that none of us minds that there are only six. 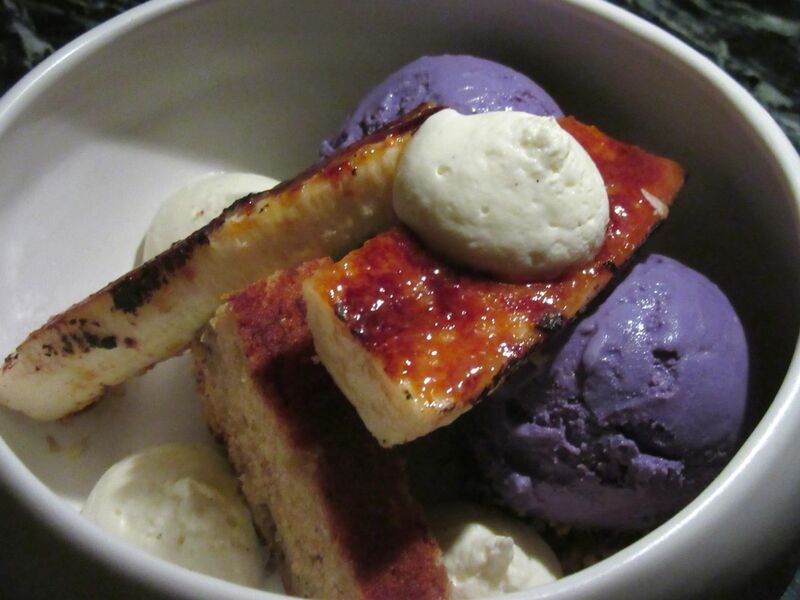 Purple ube, African pear, colors the ice cream in this dessert. 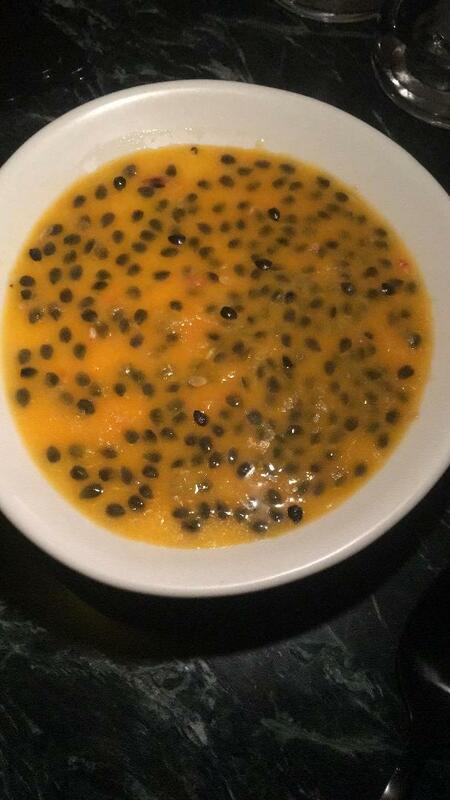 Passion fruit custard is a dessert all of us love. 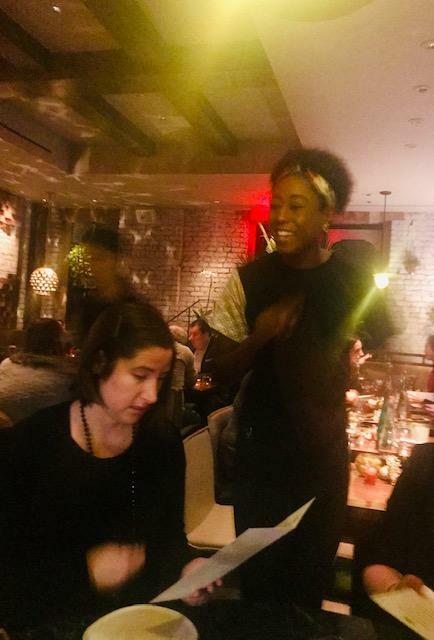 “I guess we have to taste dessert,” I announce to no one in particular, and no one in particular objects. Odd sweets arrive – a long narrow dish of tropical fruits, purple ube (African pear) sundae, and passion fruit panna cotta. 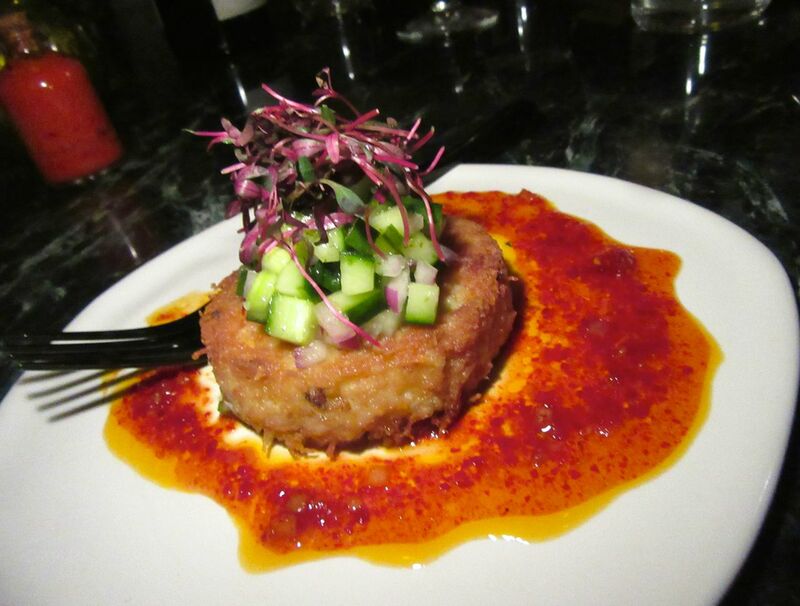 I’ll be thinking about this simple crab cake when I return to Wayan with friends begging me to get a table. 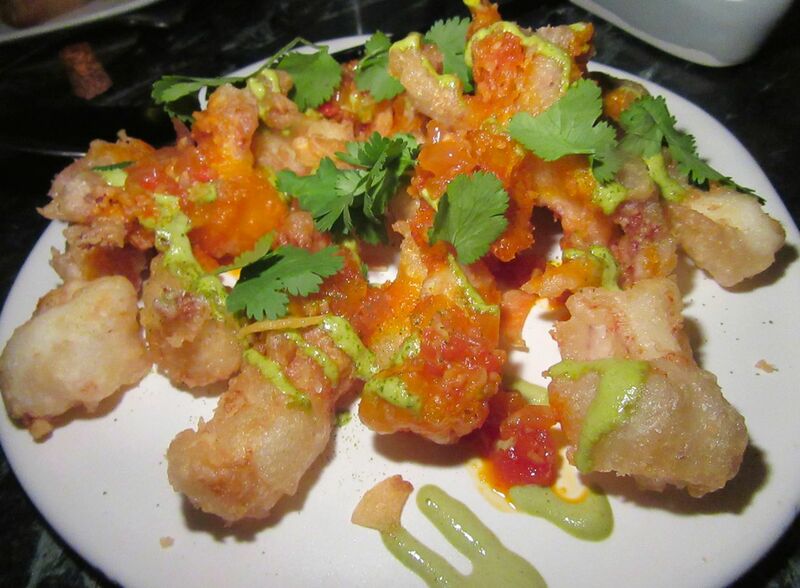 Crispy baby squid with sambal onion and chili sauce, is another favorite. How lucky we are to live on this small island where exotic taste adventures come to us. 20 Spring Street between Mott and Elizabeth. 917 261 4388. Dinner 5:30 to 11 pm. Breakfast and lunch soon.